Congrats to Kura for guessing correctly. 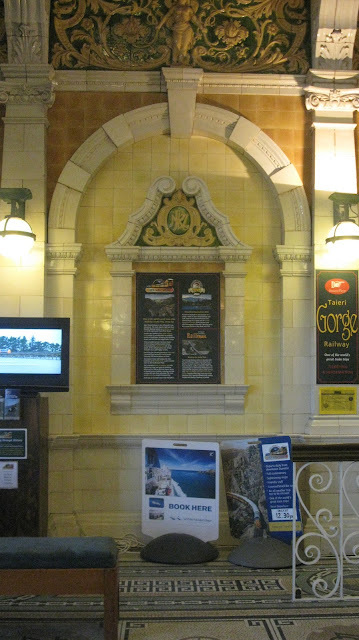 The photo in my last post was taken inside the Dunedin Railway Station. I've been snooping around town for old buildings that would've been here in the time of Amelia's novel - set in the 1880s. Alas the Railway Station is Edwardian rather than Victorian, but as it's my favourite building in Dunedin it deserves a post all of its own. It's only in recent years that it has come to my attention. I think it was a case of growing up with it and really not noticing what a gorgeous building it is. And in the last couple of years, with the destruction of so many precious buildings in the Christchurch earthquakes I started to look at my city in quite a different light. I remember in the days following the February quake, when we were all reeling from the tragic loss of life, every trip through town had me gazing at all our old buildings and trying to imagine them turned to rubble. It was a sobering exercise. Construction on the station began in 1903 and was completed in 1906, giving Dunedin its fourth station building. (So far I've been unable to unearth photos of the earlier stations.) Back then it was the busiest in New Zealand with up to 100 trains passing through per day. Which seems a staggering amount considering that these days we only have freight trains and tourists runs. 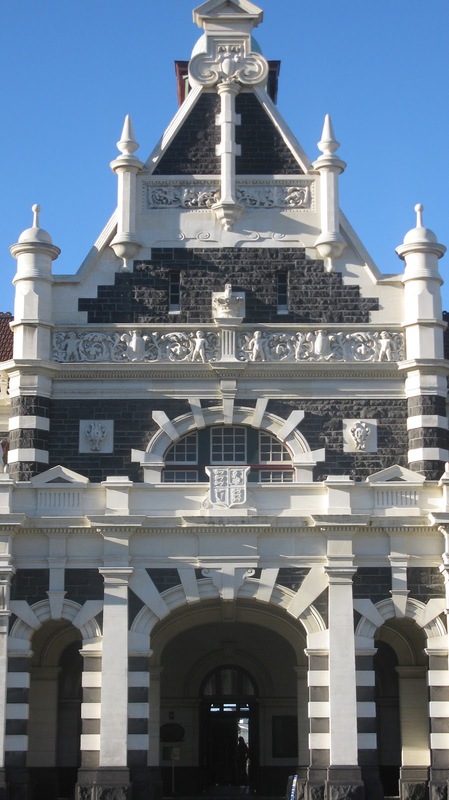 The architect was George Troup and his elaborate design, using dark basalt and white Oamaru stone, earned him the nickname "Gingerbread George". These days the station is not only used for trains. The Otago Art Society and the Sports Hall of Fame are situated on the first floor, the Otago Farmers market is held every Saturday morning, using part of the platform and a car park and every year the ID Fashion parade turns the platform into a cat walk. 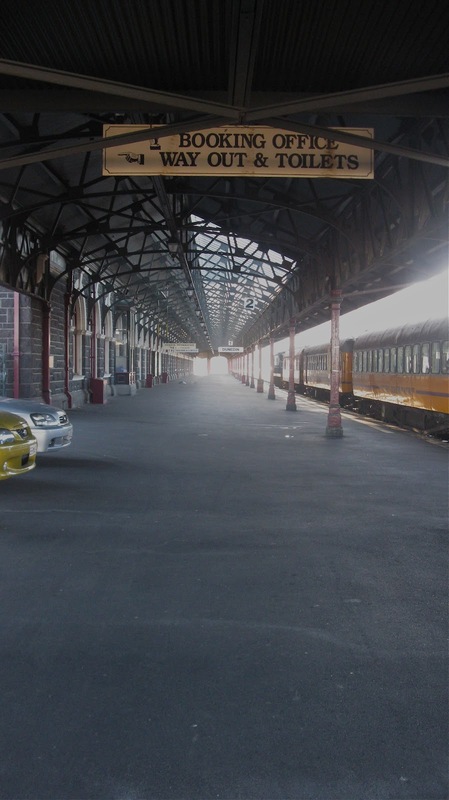 The longest railway platform in New Zealand. But it's not just the exterior that is beautiful. The inside is an absolute treat. Mosaic tiled floors, stained windows and an intricately worked balcony. The mosaic floor of the main foyer, taken from the balcony. I hope you've enjoyed your tour of Dunedin's Railway Station. Now it's back to the writing for me. Amelia's been left in a rather awkward situation and I'm looking forward to seeing how she extricates herself. Thanks for the great tour. I appreciated it. So precious. 'Gingerbread George' made me laugh; it's the perfect nickname!